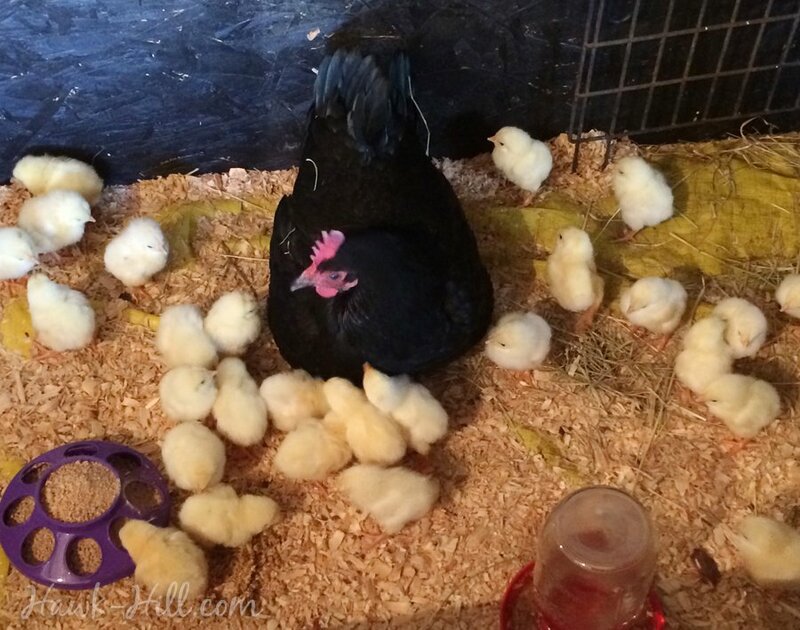 Hatching chicks, or letting a broody hen raise a batch of hatchery chicks, is a fun way to experience a less popular side of modern chicken keeping. Watching a line of chicks trail behind a mama hen as she teaches them to scratch and forage is a delightful scene for any chicken keeper. 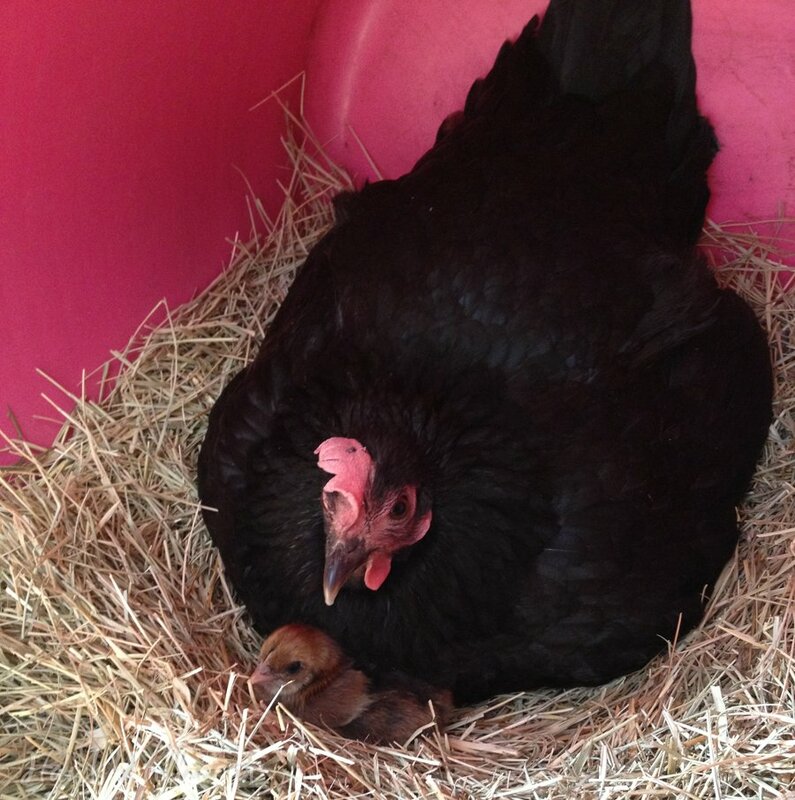 Often, when your hen frinally goes broody she’ll be in a spot that’s not ideal for hatching or raising chicks. Primarily because her chosen nest will likely be 1. elevated off the ground where chicks might be injured if they fell, or 2. in a nesting box shared with other hens. Hens will sometimes try to steal eggs or sit on another hen’s eggs (this is actually very common, in my experience) so moving your broody hen may be necessary. Thankfully, I have a particular hen who, although entirely hateful in attitude towards me, is happy to go broody at the drop of a hat, at least 4 times a year- or seemingly anytime I don’t collect eggs by noon! “Phyllis” has happily been mother to hatchery chicks and she has hatched adopted eggs I placed under her- and in the process of getting her to adopt chicks or eggs, I’ve managed to “break” her out of her broodiness a few times by making mistakes in handling her. If you’re trying to move your broody hen or encourage an adoption, here are a few tips I’ve picked up from trial and error. 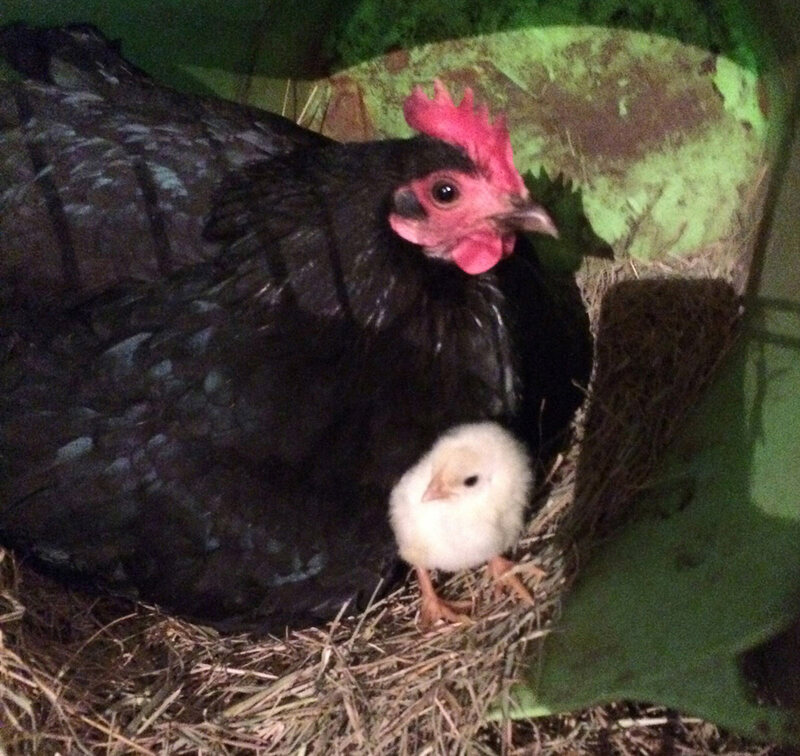 When my hen starts to go broody, I transfer her to a nest in an overturned bucket in the stable. Making the secondary location easy to transfer (i.e. a bucket) makes it much easier to move her a second time if I need to. 1. 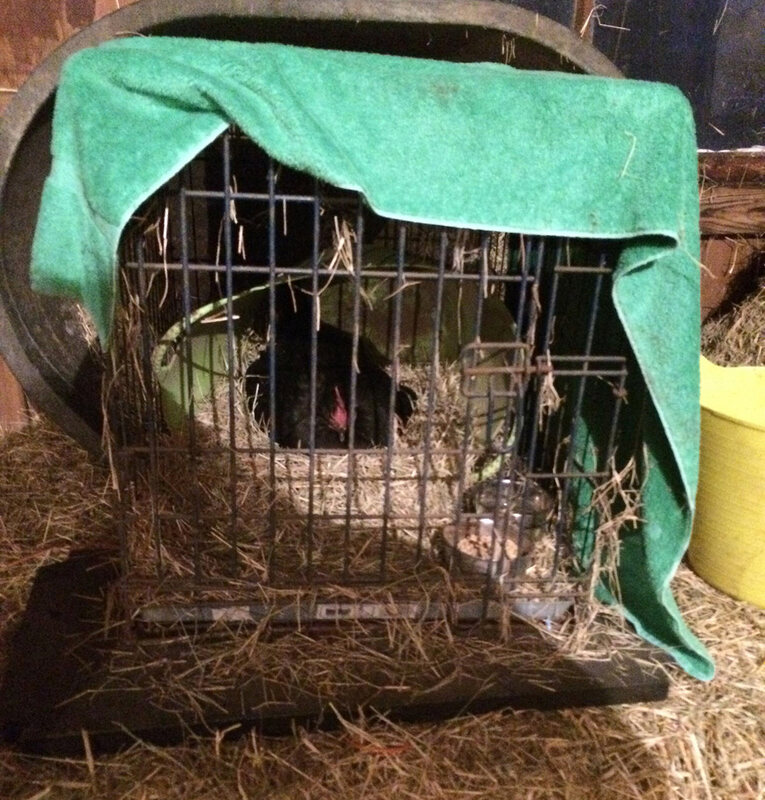 Pre-Prepare – The best advice I have for moving a broody hen is to make all your preparations for moving her during the day, and then wait to actually move her until late at night. Moving the hen and then fussing with water or food with lights or a flashlight on may upset her enough to stop brooding. Ideally a nighttime move can go smoothly that the hen immediately feels comfortable enough to fall back asleep without noticing changes. During daylight set up your broody’s new nest with everything she’ll need, so when you move her you won’t disturb her any more than necessary. 2. Practice Proper Prophylactics. Ha. Basically- wear gloves, long sleeves, and if your broody hen is as irritable as most, cover her head with a towel when you move her. The towel blocks light and if she attempts to peck your hands the towel should add an extra layer of protection. Darkeness under the towel while you move her will help keep her calm. 3. Support her Body During the Move – As you transport her to your brooder or other location, support her legs and gently hold her wings down under the towel. 4. Use Low or No Light – Move her at night and DO NOT TURN ON LIGHTS unless absolutely necessary. When I have a hen go broody I take her from the coop and place her into a cage in the stable but instead of turning on lights, I navigate using a headlamp with a red-light setting. 5. Confine – Your hen will naturally want to return to the nest she prepared, your task is to keep her settled till she adopts the new nest as her own. I do this by placing either a small bottomless dog crate over her in her new nest, or using an overturned laundry basket (the type with lots of large holes in the sides) with a weight on top to keep her from slipping out. I typically confine my hen to the nest, with no food and no water to lure her off till the following day, by which time she’s usually adopted the nest as her own and is happy to stay put. 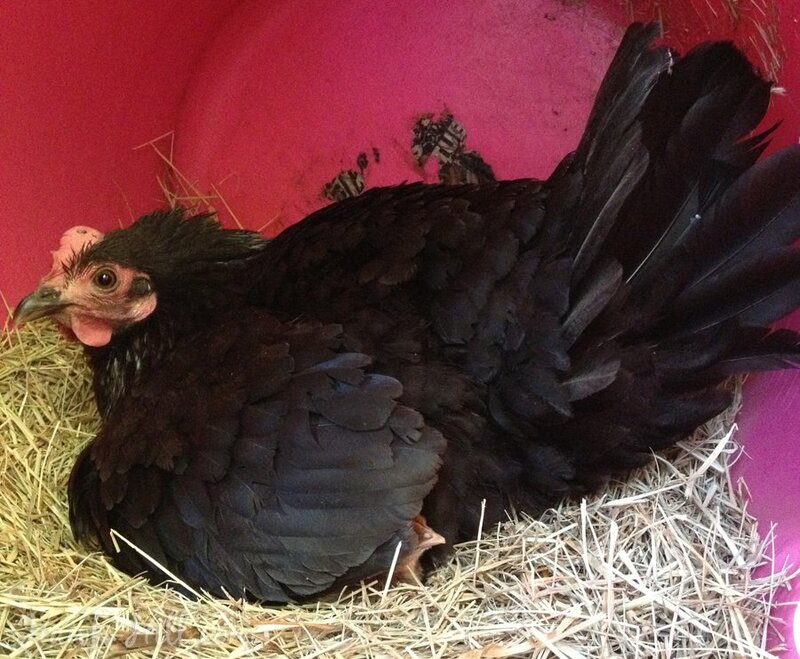 Here is a photo of my broody hen in her next (a flexible bucket on its side). Over her nest I’ve placed a dog crate to encourage her to stay on the next during transition, and over the dog crate I’ve placed a towel used during the previous night’s transfer to block light. If you successfully move your hen, she can hatch eggs or even be coaxed into caring for hatchery chicks. I love your website! I tried getting my rescue pigeon (broken wing) to occupy himself in my studio apartment by babysitting quail eggs that I purchased at Pike Place Market. In the end, he and his wife preferred to destroy the nest and take their territory back. It was hilarious to watch.